Whitney's Strawberry Kiwi Lemonade Concentrate - Canning Homemade! It's amazing the flavor combinations that have been popping up on my site for this summer's hottest drink, fruit lemonade concentrate. 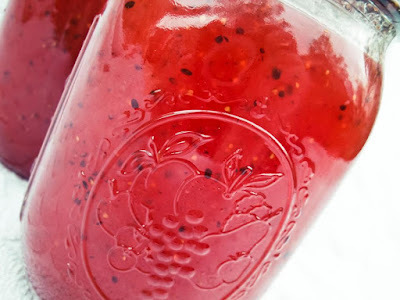 Based on a basic recipe from the Ball Complete Book of Home Preserving the popularity on my FB page has been a weekly post of some amazing flavors, both in singular fruits but now Whitney has come with a fantastic combination, Strawberry Kiwi! (I think it ended up being a large clamshell of strawberries and 9 kiwi - all from Bountiful Baskets Food Co-op). Here is the basic recipe with Whitney's adaptations. Thank you Whitney for sharing this inspiration with me and the canning community! In a food processor, blender or bullet puree strawberries and kiwi in batches. Transfer strawberry/kiwi puree to a stainless steel saucepan over medium-high heat. DO NOT BOIL. Add lemon juice and sugar and stir to combine.